Are you unhappy with your smile because of dull and discoloured teeth?Are your teeth stained from habitual coffee drinking, smoking or red wine?Do you want to show off your pearly whites in selfies and other photos? If the answer is 'YES' to any of these questions, tooth whitening may be right for you. People who are dissatisfied with their teeth are less likely to smile and as a result often appear unhappy or moody. Our office is committed to providing every patient with a bright and brilliant smile that can completely transform not only their appearance but their confidence. Stained and discoloured teeth can be caused by a number of factors including the types of food and beverages consumed, smoking habits, age, injury, and medications. Years of drinking wine, coffee and soda can often result in stained teeth. The teeth whitening process can help you regain a brighter and whiter smile in as little as under an hour. Even teeth that are yellow due to smoking can be whitened by this process. Our Mississauga office provides two type of teeth whitening treatments – In-Office which can be done in under an hour OR Take-Home in which Custom Whitening Trays are created for you so you can whiten in the comfort of your own home, at your convenience. Our office uses SpaDent In-Office Whitening which is a quick system that provides sensational results and in some cases teeth that are up to eight shades whiter! SpaDent treatments take just one hour to complete and your results are visible immediately and will continue to brighten over the next couple of weeks! There is virtually no sensitivity with SpaDent. A small percentage of people will have minor gum discomfort which typically dissipates in less than 10 minutes. Problems with enamel are associated with acidic and abrasive products. SpaDent is pH neutral, has no silica in it and has Xylitol which neutralizes the bacteria that causes plaque. During the SpaDent treatment, your oral care clinician will be placing on a barrier material to protect your gums and also vitamin E oil on your lips to ensure your tissues are comfortable during your treatment. Many people choose SpaDent Teeth Whitening because it is able to visibly whiten your teeth up to eight shades whiter with minimal discomfort if any in under an hour! After your treatment, your oral care clinician will provide you with a syringe of whitening toothpaste to use at home. You will brush with this every night using a pea-sized amount for 2 minutes and until you have used up the complete syringe. It should last about a week. For the first hour after your treatment only drink water and then avoid staining foods for 24 hours. When you prefer to whiten your teeth in the comfort of your own home, you can choose to have Custom Whitening Trays made. These can be used repeatedly, so you can whiten your teeth whenever you choose. The Professional Whitening Touch-Up kits are available for purchase from our office. Avoid stain-causing foods, such as coffee, red wine and dark colas. 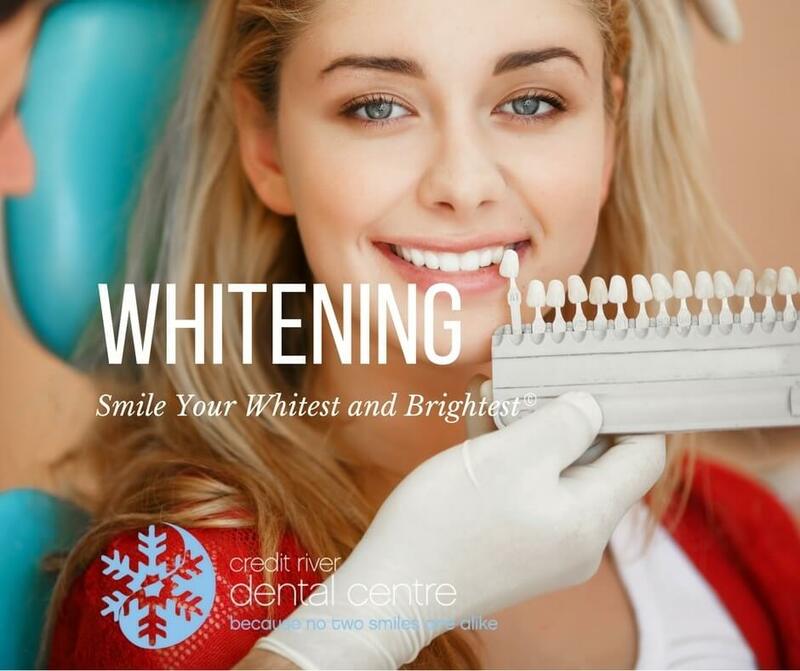 If you think any of our teethe whitening treatments might be right for you, or you want to gain more information on the process, contact your Team at Credit River Dental Centre, your Teeth Whitening Mississauga Office at (905) 278-4297!!! The above are sample cases of teeth whitening in Mississauga, ON. We welcome you to contact us to learn more about the various teeth whitening treatment plans that may be suitable for you.